After reading the 2007 New Zealand Book Award History prize-winning book Vaka Moana (2006, K.Howe ed.) and Atholl Anderson’s chapters of the 2015 Royal Society of New Zealand Science Book prize-winning book Tangata Whenua I think I understand that stages in the evolution of the shunting oceanic-lateen were first the double-sprit, next the oceanic-sprit, next and crucially the prop-masted oceanic-lateen, as used by Tonga in her ‘imperial’ period, which may have reached the Cook Islands from Tonga in or before the 11th century, and finally the shunting oceanic-lateen. This is the ‘flyer’ type, which so impressed visiting Europeans, first Magellan in Guam in 1521, then the Dutch in Batavia Java, in the 17th century and later the English and the French in northeast Polynesia in the 18th century. The shunting oceanic-lateen arguably out-performed any other sailing rig in the world, but in order to tack by ‘shunting’, waka that used it needed to be double-ended. In order to to make return trips to South America, Easter Island, Hawaii and Aotearoa, East Polynesian voyaging waka had to sail fast, at least with and across the wind. 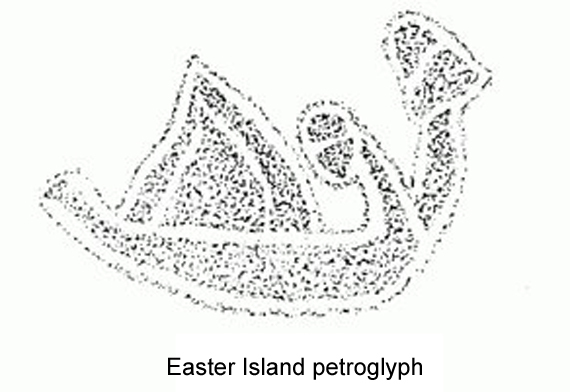 The sail used on some of the voyaging canoes that came here in the thirteenth century could possibly have been the prop-masted oceanic-lateen, as indicated by the Wairarapa coast landforms called Kupe’s sails and also by an Easter Island petroglyph. This was also the sail first seen by Europeans on an open ocean voyaging canoe. 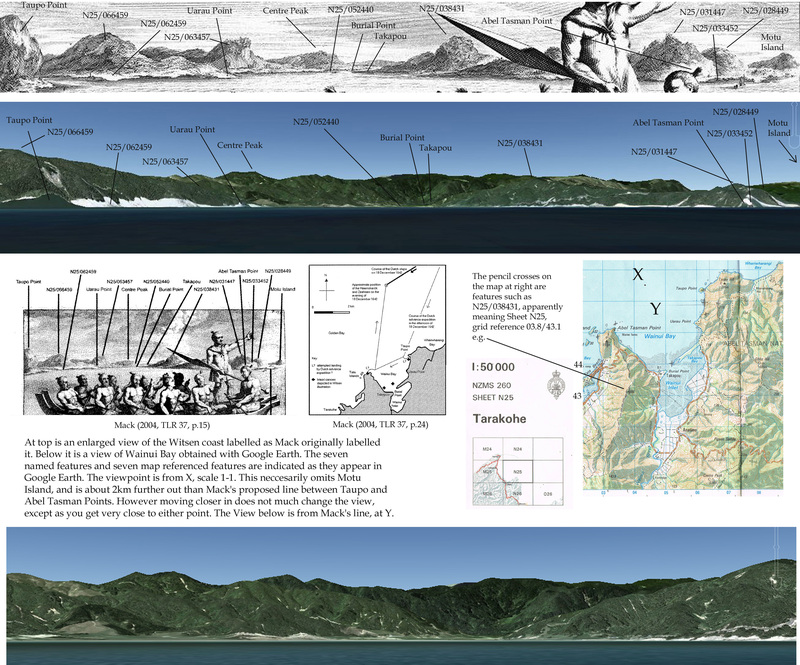 The Schouten and le Maire expedition sighted, captured and eventually released a Tongan double hulled voyaging canoe with a complement of about 25 possibly on its way from Tonga to Samoa in 1616. Tonga and Samoa may have first developed prop-masted lateen sails centuries before, perhaps even before the 11th century. In that case East Polynesians would very possibly also have acquired them, perhaps through the Cook Islands, and used them in the the 12th and 13th centuries for their far-ranging trans-Pacific voyages. Can present day New Zealanders, descendants of the colonisers and the colonised, construct a post-colonial and more bi-cultural view of our shared history; can we assess the story of the first recorded meeting between Maori and Europeans post-colonially? One major problem is that every single contemporary text we so far have to use in doing so was written down or drawn or charted by a European. Michael Ross has kindly agreed to our adding his article The Mysterious Eastland Revealed (The Globe #53 (2002), Ross, M, ‘The mysterious Eastland revealed’, p.1-22.) as another Tasman related ‘resource’ on this site. It was an internationally peer reviewed paper that won the Estelle Canning prize on presentation. Robert and Penny set up this website as volunteers, because we wanted to increase awareness of Tasman’s role in global and New Zealand history. Robert has done most of the posts so far, but is happy for others with a knowledge of WordPress (e.g. Dave Horry, who has already helped a bit) to be co-administrators and post under their own names. Penny has contributed in various ways, and generally clears the website email address. On top of management and administration there are overhead costs, so it would be lovely if we could attract a few donations. You can also send an email to tasman1642.nz@gmail.com if you’d like to be added to our mailing list. 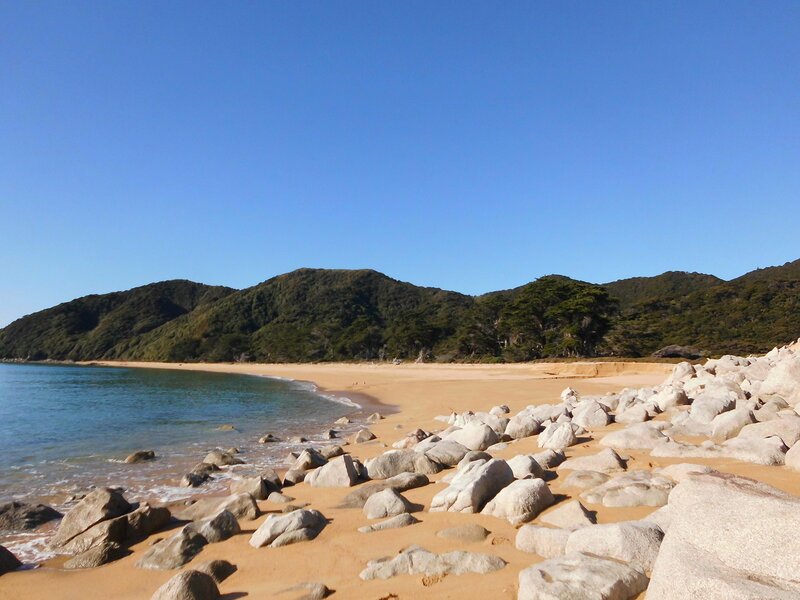 Abel Tasman news of course! Till very recently I speculated that some of the later SAC illustrations, including ‘people of Island Moa Iamna and other surrounding islands’ and ‘Thus appears the vessel of Noua Guinea and people dwelling therein’ might have been the work of a different draughtsman/copyist. I thought I saw in them a somewhat tidier, less sketchy style. But now, on close examination of details such as those I’ve pasted in below, I’m coming to the view that all the large composite illustrations were created and copied by one man. Was Gilsemans really Tasman’s primary draughtsman? Who was the expedition’s primary draughtsman, and was there more than one? Some commentators have attributed ‘A View of Murderers’ Bay’ to Isaac Gilsemans. On August 1st 1642 Gilsemans was described as having “fair knowledge of seafaring, and the drawing of lands”; however he may not have been the only senior officer with these abilities, and in my view was unlikely to be the man specifically appointed as draughtsman. One interesting point which Mack’s sketch map of Wainui Bay and Wharawharangi beach draws attention to is that the first likely ‘watering place’ the small boats would have seen was at Wharawharangi Beach. Why would they go straight past it, heading instead to Taupo Point where there is only a very minor stream, one they could not have seen at all unless they got quite close, and then to Abel Tasman Point, where there is no stream to speak of at all? Wouldn’t they have tried Wharawharangi first? Wharawharangi beach, where a sizeable creek forms a fresh water lagoon behind the sand at center right. Could it have been that waka hunua (double hulled ocean going canoes) were already present on or near this beach on the 18th, manned possibly by a large taua (group of warriors) who had used this as a stopoff as they traveled between Te Ika a Maui (The North Island, where Maori populations were largest) and Te Wai Pounamu (the West coat of the South Island) where highly valued greenstone could be found. Contemporary illustrations of past events can and do complement written history, and much may yet be learned, as Patricia Wallace has shown in her 2006 article ‘Traditional Maori Dress: Recovery of a Seventeenth–Century Style?’, from illustrations that appear in the State Archives Copy (SAC) of Tasman’s Journal. As Andrew Sharp explains in The Voyages of Abel Janszoon Tasman, the SAC, which still bears Tasman’s signature, is likely to have been one of several “day registers of the aforesaid Tasman” that were consigned to the Netherlands from Batavia and mentioned in a V.O.C. report dated 22 Dec.1643. Sharp further comments that the SAC illustrations were “evidently drawn in in spaces left for them in the text” and that our two surviving journal texts, SAC and Huydercoper, are “independent copies of the same [now lost] original journal”. We therefore have sound provenance for SAC; we know its charts and illustrations were produced by V.O.C. employees in Batavia in 1643, and may presume they were derived from originals created on Tasman’s 1642-1643 expedition, since he himself authenticated them by signing them. Problems may well occur if later illustrations that apparently derive from SAC are thought to be a source of further data not contained in the originals, and so a valid basis for new written history. 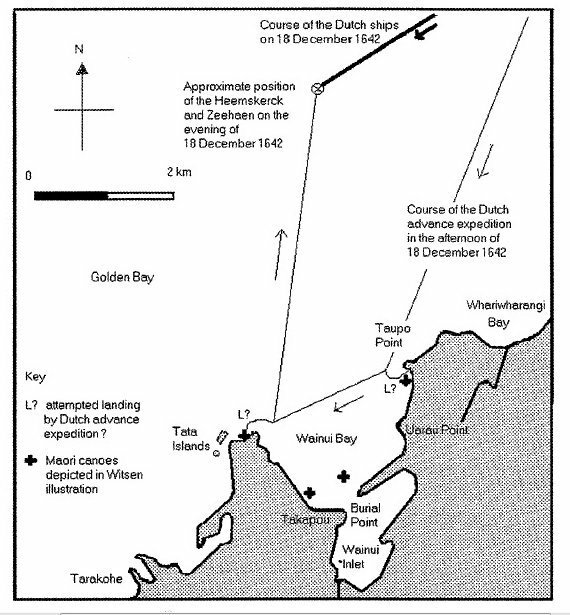 Such problems plague an article by Rudiger Mack, ‘Did Dutch Sailors land in Wainui Bay on 18 December 1642: The First Printed Illustration of New Zealand’ ( 2004 Turnbull Library Record (TLR) 37, 2004) which seeks to overturn existing Tasman history on the authority of Vaertuig en Gedaente der inwoonders van Selandia Nova (Vessel and appearance of the inhabitants of New Zealand’), a plate commissioned by Nicholas Witsen to illustrate his 1705 work Noord en Oost Tartarije.